That Angry Trump Twitter Account is Fake. No, the Other Angry Trump Twitter Account. Before you retweet some hilariously indignant missive from Donald Trump, we suggest you look a bit closer. Granted, Trump is known for saying outlandish things on Twitter. But there are so many fake Trump Twitter accounts, you might be retweeting a “parody” account. 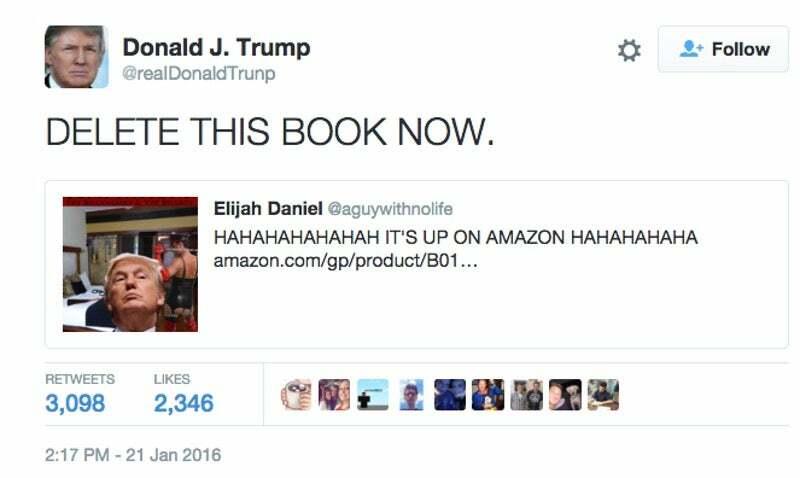 For instance, here’s a tweet that’s doing the rounds, in which “Trump” is furious about a new erotica book featuring The Donald himself, Trump Temptation: The Billionaire and the Bellboy. The only problem? The account isn’t Trump. If you look closely the Twitter handle is @realDonaldTrunp, with an N where the M should be. At the time of this post, the tweet has over 3,000 retweets and over 2,000 likes. And I’d wager that at least half don’t know it’s a fake account. In fact, there are nearly a dozen fake Donald Trump Twitter accounts, made to look exactly like the real thing — complete with the same photo. There’s @realDonaIdTromp, @realDonaldTrumd, and @pealDonaldTrump. By far the most convincing, and the one with the largest following, is @realDonaldTrunp. Be careful who you retweet, but don’t forget to pick up a copy of that Trump erotica book, Trump Temptation: The Billionaire and the Bellboy. Or don’t. The author even cautions against it, explaining that he wrote it in four hours while he was drunk. Buy it or don’t. It’s a free country. For now, at least.